Rangers Hunting and Shooting Club President Geoff Mackay, left, Secretary Steve Constable and Secretary Warren Kennedy with Northern Tablelands MP Adam Marshall. 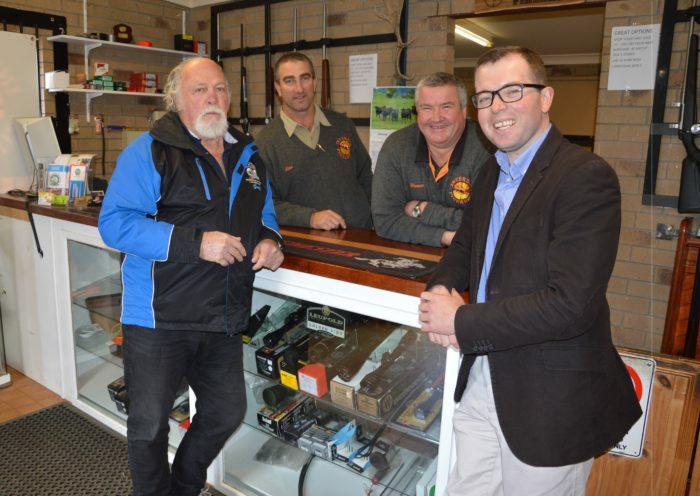 MEMBER for Northern Tablelands Adam Marshall has today announced $11,100 in State Government funding for the Rangers Hunting and Shooting Club to purchase two shipping containers for conversion into storage and amenity units at their Emmaville base. Mr Marshall said the funding was part of the government’s 2015/2016 Safe Shooting Program and would allow the club to purchase the containers and relocate them. “The Rangers Hunting and Shooting Club are a group of firearm enthusiasts from across the Electorate who use the historical shooting range near Emmaville,” he said. “Their members have varied interests in all types of firearms, with some members enjoying western role play replete with six shooters and black powder long arms. Rangers Hunting and Shooting Club President Geoff Mackay said the funding assistance will make the Emmaville Range more user-friendly while improving the range safety. “The funding provided will be used to purchase two large shipping containers which will be converted to store targets, seating and safety gear,” Mr Mackay said. “We also have plans to convert part of one container as an amenity area for parents with young children and babies, creating a safe and comfortable place to attend to those necessities of life. The Rangers Hunting and Shooting Club meet at the Emmaville Shooting Range on the fourth Sunday of each month and information is available at Inverell Firearms.